Moses Dickson was born in Cincinnati, Ohio, on April 5, 1824. At 16, he began a three year tour of the South which persuaded him to work for the abolition of slavery. On August 12, 1846, Dickson and twelve other men gathered in St. Louis to devise a plan to end slavery in the United States. They formed a secret organization known as the Knights of Liberty which planned to initiate a national insurrection against slavery. Dickson married widow Mary Elisabeth Butcher Peters at Galena, Illinois on October 5, 1848. They had one daughter, Mamie Augusta, and a year later the family located permanently in St. Louis. By 1856, according to Dickson and his followers, 47,240 members of the Knights of Liberty throughout the nation stood ready to fight for freedom. In August of that year Dickson created a smaller secret organization, the Order of Twelve, in Galena, Illinois. During the war, the Knights disbanded and many of their members joined the Union Army. In 1879-1880 when approximately 16,000 Louisiana and Mississippi African Americans migrated to Kansas in what was called the Exodus Movement, Rev. Dickson served as President of the Refugee Relief Board which provided them aid and support. 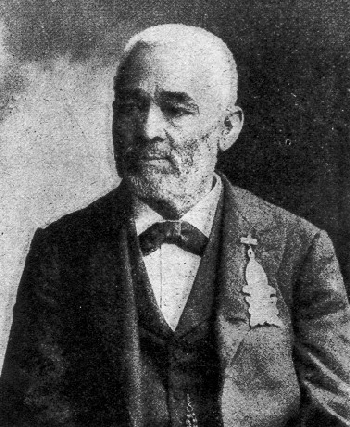 The Revered Moses Dickson died a decade later on November 28, 1901 and was buried at St. Louis, Missouri. Reverend Moses Dickson, Manual of the International Order of Twelve of Knights and Daughters of Tabor 3d. ed. (St. Louis: A. R. Fleming Printing, 1900); William A. Muraskin, Middle-Class Blacks in a White Society: Prince Hall Freemasonry in America (Berkeley and Los Angeles: University of California Press, 1975).